Eleven-year-old Rylie Heflin with her father, Rob, at the Hartefeld National Golf Course. Some of the finest young golfers in the United States flocked to the Hartefeld National Golf Course this past weekend, with a few coming from as far away as Arizona and Canada. In contrast to the many weary travelers who arrived in Avondale tired from travel, all 11-year-old Rylie Heflin had to do was walk outside the front door of her home. Heflin, who lives with her family in a home that borders a hole on the Avondale course, was one of 65 golfers between the ages of 9 and 19 who braved 35-mile-per-hour winds to compete in the International Junior Golf Tour’s Major Championship on April 5 and 6. This tournament is one of 60 events the tour sponsors around the United States each year that give highly skilled young golfers a chance to compete against some of the top talent in their respective age groups. Since its beginning in 1995, the IJGT has become one of the largest proving grounds for the nation’s best young golfers, where players from 43 states and 43 countries compete in tournaments at some of the most prestigious golf courses in the nation. In addition to attracting the interest of college coaches, players compete for double IJGT Merit Points and national rankings, as well as an invitation to the IJGT’s Bridgestone Tournament of Champions, which will be played this year on May 24 to 26. Hosting an event like the IJGT amounts to a giant feather in the cap for Hartefeld’s future aspirations, one of which is to host a PGA tour event, which it last did in the late 1990s. The tournament was dotted with several locals, many of whom finished in the top tier of the tournament. In the Boys 15-19 Division (Par 72), Ryan Rucinski of Wilmington, Del., shot a 152 for the weekend, good enough for second place, while Brandon Bree of Kennett Square shot a 160, good enough for eighth place in a field of 45. 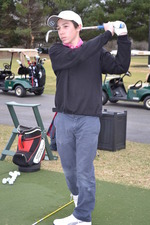 Other local golfers who competed in this age group were Liam Murphy and Joe Togani of Hockessin; Matthew Cleary, Ryan Cleary and Reed Winkler of Wilmington; Kevin Levitsky of Oxford; Ryan Bree of Kennett Square; and Ethan Means and Alex Patellis of Landenberg. In the Boys 14 and Under Division (Par 72), Evan Brown defended his home course to win the Major Championship with a combined score of 150. In round one, he had two birdies, coming on par-fives on the front nine. He finished the first round with a four-over-par score of 76, which gave him a four-stroke lead going into the last round. On day two, Brown began his front nine with six pars, and added a birdie on the par-three hole number 14. He headed into the final nine holes with a one-over-par, and added two more birdies during his final nine holes. Other local competitors in this division were Marc Groenhuysen of West Chester, who finished in second place with a combined score of 157. In the nine-player Girls’ Division (Par 72), Esther Park of Wilmington shot a combined 167 for the tournament, good enough for third place. Heflin, a student at Sanford School in Hockessin, may have finished with the highest score in her division, but to her father, Rob, it’s not about the breaking par just yet. He said playing in the IJGT tour gives his daughter the chance to compete on a higher playing field. In ten years, Heflin envisions herself playing at the collegiate level, in preparation for someday making the LPGA Tour.